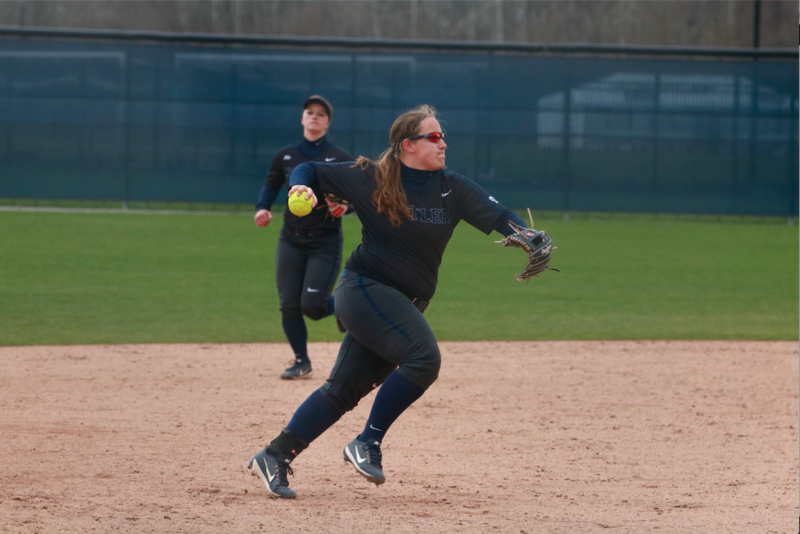 The Butler University softball team pulled off two come-from-behind victories to go 2-1 at Georgetown University from April 14-15. The Bulldogs are now 15-21 on the season and 5-4 in Big East play. In the first game of the weekend, Georgetown got on the board first with two runs in the third inning. Butler scored a run in the top of the fourth inning on a sacrifice fly by junior infielder/pitcher Kaitlin Doud, but the Hoyas matched it with a run of their own in the bottom of the frame. Sophomore outfielder Payton Longest drove in Butler’s second run of the game with a double in the top of the sixth inning, but Georgetown tacked on three more runs in the bottom of the sixth for a 6-2 victory. Freshman Alyssa Graves made the start for Butler, surrendering three earned runs over four innings while walking three and striking out four. Sophomore Gabbi Schnaiter allowed the final three Georgetown runs over two innings while walking two and striking out one. After that loss, the Bulldogs responded with back-to-back come-from-behind wins to finish the weekend. In Saturday’s second game, Georgetown struck first again with three runs in the second inning. The two teams traded single runs in the fourth inning, with Butler’s run coming on a solo home run from senior infielder Alyssa Lach. Heading to the sixth inning, Bulldogs looking for a rally. Georgetown leads, 4-1. In the sixth inning, the Bulldogs scored three runs to tie the game. Longest drove in two with a triple and redshirt freshman catcher Elyse Babb brought a run home with a sacrifice fly. Georgetown reclaimed the lead with a sixth-inning solo home run, but Butler scored two runs in the top of the seventh on a triple by junior catcher Sammy Andersen and double by Doud to take a 6-5 lead into the bottom of the frame. Pitching in relief, Graves walked in the tying run but was able to limit the damage and send the game to extra innings. In the top of the eighth inning, sophomore first baseman Madi Christiansen homered to give the Bulldogs the lead, and Schnaiter pitched a scoreless frame to pick up the save and secure a 7-6 Butler victory. Doud pitched the first six innings for Butler, giving up five earned runs on eight hits before giving way to Graves. On the final day of the weekend, Butler came from behind to win once again. Georgetown scored a single run in the first inning and six runs in the fourth inning to grab a sizeable lead. The Bulldogs responded with a five-run fifth inning before the Hoyas scored a run in the bottom of the frame. Butler entered the seventh inning down 7-5, but scored eight runs in the inning to take the lead. Georgetown scored one run in the bottom of the seventh, but Butler prevailed 13-9. All of Butler’s nine starters scored a run in the contest. Junior outfielder Jenna Foreman led the team with three hits and also picked up three RBI. Longest and sophomore outfielder Alyssa Garcia each had two hits. On the mound, Doud threw 5 ⅓ innings, surrendering five earned runs while walking four. Graves came on in relief but gave up two unearned runs without recording an out before giving way to Schnaiter, who pitched the final 1 ⅔ innings while giving up one run. The Bulldogs return to action at home on Wednesday, April 18, against Ball State University.